At One Stop Handling.com we have a wide range of handling equipment. Included within our diverse range is the display pallet lifter which has been designed as a smaller version of the conventional pallet truck. The main aim of the pallet lifter is to bring pallet lifting to the forefront of superstores such as supermarkets, garden centres and retail outlets where the larger pallet truck may prove to be a hindrance or unsuitable, due to its bulkiness. One Stop Handling.com offers one model in its range of display pallet lifter, however due to its adaptability we are confident that this will be able to fulfil all of your requirements. The Warrior display pallet lifter has been designed for use with the smaller plastic quarter sized pallets, commonly seen in retail and commerce environments. 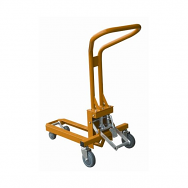 The pallet lifter is compact and easily manoeuvrable, proving ideal for use in store front settings, where a pallet truck may prove cumbersome. The mobility of the pallet lifter is provided through the four rubber castors which it is mounted on. The front two are fixed, however the rear two nearest to the operator are fully rotational creating a large arc of movement. The Warrior display pallet lifter is able to safely lift and carry loads to a weight capacity of 200Kg, easily and efficiently. The truck has a lift range of 25mm, from 95mm at the forks lowest height to 120mm at the forks highest height. Designed with ease of use at the forefront, the display pallet lifter has been fitted with mechanically operated lift, which enables easy and effective lifting for the operator, whilst simultaneously eliminating the spillage and slippage of oil, which can occur with hydraulically mechanised handling equipment such as the pallet truck. The forks have been perfectly designed for use with plastic quarter sized pallets, measuring a length of 580mm, and a width of 210mm. At One Stop Handling.com we have massive stock holdings equating to a value of over one million pounds, due to this we can almost guarantee that we will be able to provide for your unique handling equipment requirements. Having this level of stock holding also allows us to deliver the vast majority of orders within three days of the orders placement. If you have any questions relating to the display pallet lifter, or any of our handling equipment stock, please do not hesitate to contact our technical team on 01384 895859, who will be happy to answer any questions you may have, applying their years of industry knowledge and experience to provide insightful and in-depth feedback relating to your specific queries.The Warrior Display Pallet Lifter brings display pallet handling into the forefront of our superstores. An ingenious solution to allow plastic display pallets to be mechanically lifted and transported without the hindrance caused by oversized pallet trucks and of course eliminating the possibilities of hydraulic oil spillage and slippage.